As with The Jetsons cartoon, our imaginations run wild with the idea of modern gadgets to make our homes efficient and automated, and make our lives simpler. For cutting-edge products you can control from your smartphone, check out these contributions from the International Consumer Electronics Show. Held each year in Las Vegas, the event showcases technological advances and products that offer cutting-edge advances in consumer technology. Home security cameras work well when you’re home, but what about when you’re away? The DoorBird home security camera sends an alert to your smartphone every time your doorbell is rung. The integrated speaker system allows you to talk to the visitor even if you’re not there, and keeps track of who comes and goes. You can even open your door for delivery, cleaning and repair personnel from another room or another location. The system comes with a motion sensor, Wi-Fi connection and available add-on cameras. The DoorBird runs from an app on your Apple iOS or Android device. No matter how efficient the heating and air-conditioning is in your home, one room or another may be warmer or cooler than the rest of the home simply due to its orientation to the sun. There is no longer any reason for one room to be sweltering and another to be freezing with the Ecovent. Working with your existing central air system, the Ecovent replaces your current wall, floor or ceiling vents with battery-powered vents that open and close automatically to send the cool air to where it’s needed most. The system knows the temperature in every room and adjusts the vents accordingly. 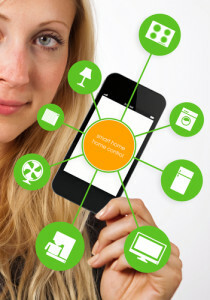 Operating from your smart phone app, the system also works with smart thermostats such as the Nest learning thermostat. Easily installed by most do-it-yourself-ers, the Ecovent system improves energy efficiency by up to 30 percent. Okay, your home doesn’t really have an attitude, but you do. And bright an early in the morning it can be a little testy until you get your first jolt of caffeine. Or, what about a fresh cup when you walk through the door at then end of a long day? Introducing the Smarter Wi-Fi coffee machine that grinds, brews and pours your coffee all from the control of your smartphone app. This coffee maker alerts you when your coffee is ready and offers you a fresh cup of coffee when it detects that you’ve arrived home. While there are other smart coffee makers on the market, this one differs in that it brews a single serving instead of an entire carafe. Having high-tech gadgets for your home is great, but what if you just need the home? We can help you with that. Give us a call and we’ll help you find a home for all those gadgets to go in.